This week’s “Back-Up of the Game” presented by Venyu is right tackle Denzelle Good. The man who spent the past three seasons blocking at the Division II level made his NFL debut Sunday, starting at right tackle. Rookie Denzelle Good, from Mars Hill University, got the start on Sunday with Joe Reitz flipping over to left tackle, in place of Anthony Castonzo (sprained MCL). Normally, a four-penalty day (three on offense) for an offensive lineman wouldn’t lead to a noteworthy debut, but that wasn’t the entire story for Good. The right edge was secure with Good starting, as the 350-pound seventh-round pick filled in more than adequately. With Chuck Pagano listing Castonzo as “week-to-week”, there’s a decent chance the starting experiment will continue with Good in the lineup. “He’s a great kid,” Matt Hasselbeck said of the current right tackle. INDIANAPOLIS – The Colts strung their winning streak to three games on Sunday in a 25-12 victory over the Buccaneers. It was a dominant second half for the Colts with their defense pitching a shutout and the offense finding the end zone twice. The Colts (6-5) will next head to Pittsburgh (6-5) for a Sunday Night Football matchup in Week 13. STIRRING HALFTIME MESSAGE – Led by veterans Matt Hasselbeck and Kendall Langford, halftime messages definitely resonated with their teammates Sunday. The Colts looked like a totally different team following intermission. A 12-6 halftime deficit evaporated quickly for the Colts, helping them notch their third straight victory. HASSELBECK CONTINUES TO LEAD – Jameis Winston called him “a straight surgeon” after watching Matt Hasselbeck operate on Sunday. Hasselbeck’s 315-yard, two-touchdown outing was once again highlighted by no turnovers. Hasselbeck joined Brett Favre as the only 40-year-old quarterback to win four straight starts in a single season. COLTS RAMP UP PASS RUSH – Just like they did in Atlanta last week, the Colts pass rush was a different animal in the second half. Four sacks for the defense stymied anything the Bucs tried to do after halftime. The Colts were able to control field position thanks to a strong start to the second half from the defense. HOUSTON KEEPS PACE – With a pair of home wins over the NFC South, the top of the AFC South kept pace on Sunday. At 6-5, the Colts hold the division lead over Houston (6-6) because of their Week Five victory over the Texans. These two appear to be on a crash course for a massive Week 15 meeting at Lucas Oil Stadium. ONE MORE IN PRIMETIME – The Colts will have their fifth and final primetime game of 2015 next Sunday in Pittsburgh. The Steelers are coming off a 39-30, cross-country, loss to the Seahawks on Sunday. Ben Roethlisberger is undergoing the concussion protocol so that will be a major storyline heading into next week. The Indianapolis Colts today claimed running back Daniel Herron off waivers and waived running back Zurlon Tipton. Herron, 5-10, 213 pounds, played in four games for the Buffalo Bills this season and registered 11 carries for 37 yards (3.4 avg. ), three receptions for 20 yards and four kickoff returns for 92 yards before being waived on November 25. 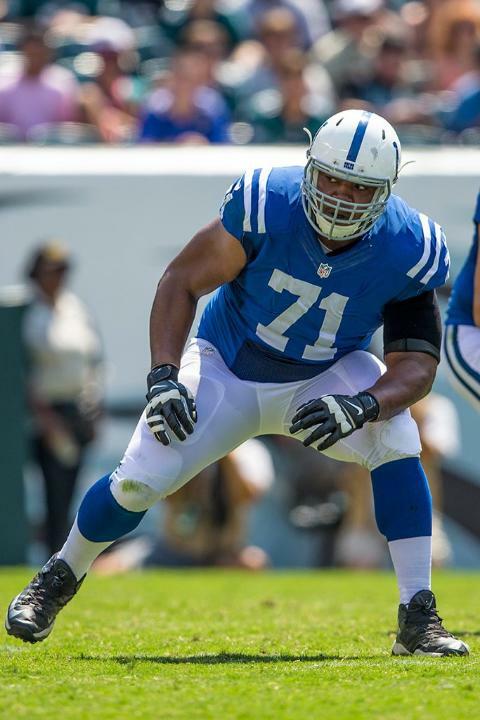 Herron was waived-injured by the Colts on September 6, 2015 and was placed on the team’s Injured Reserve list the next day. He was waived from the Injured Reserve list on September 11 before signing with the Bills on October 6. Herron has played in 29 career NFL games (three starts) and totaled 98 carries for 426 yards (4.3 avg.) and one touchdown, caught 25 passes for 250 yards and returned eight kickoffs for 183 yards. In 2014, Herron played in all 16 games (three starts) for the Colts and registered 78 carries for 351 yards (4.5 avg.) and one touchdown and made 21 receptions for 173 yards. He also started all three postseason contests for Indianapolis and rushed 45 times for 170 yards (3.8 avg.) and two touchdowns. Herron added 20 receptions for 128 yards in postseason play. He originally signed with the Cincinnati Bengals as an undrafted free agent on May 23, 2012. Herron spent time on the Bengals active roster and practice squad in 2012. He spent the first five weeks of the 2013 season on the Bengals practice squad before being signed to the Colts active roster on October 9, 2013, where he spent the rest of the season. Collegiately, Herron played in 41 games (22 starts) at Ohio State. His career totals included 592 carries for 2,869 yards (4.8 avg.) and 32 touchdowns to go along with 44 receptions for 309 yards and one touchdown. Herron earned First Team All-Big Ten honors as a junior in 2010. Tipton, 6-0, 230 pounds, was signed to the Colts practice squad on September 15 before being elevated to the active roster on October 1. Tipton has played in 13 career NFL games and recorded 12 carries for 27 yards and six receptions for 68 yards and one touchdown. He has seen action in three postseason contests and tallied 18 carries for 68 yards and one touchdown and three receptions for 22 yards. The NFL today announced that the Jacksonville Jaguars will host the Indianapolis Colts on Sunday, October 2, 2016 at Wembley Stadium in London as part of the UK International Series. The game time will be announced at a later date. This will be the Colts first time participating in the International Series and their first regular season game outside of the United States. Jacksonville will return to London for a fourth consecutive year, and last month committed to playing a home game in London through 2020. This will mark the Jaguars first time playing an AFC South opponent in London. Indianapolis has previously played three preseason games abroad in Mexico City, Tokyo and Toronto. The Colts jumped out to an early 21-0 lead over the Steelers as quarterback Peyton Manning connected on two touchdown passes and running back Edgerrin James scored on a two-yard run. Pittsburgh was able to score 17 unanswered points to narrow the deficit to 21-17. A 22-yard made field goal in the fourth quarter extended the Colts lead to 24-17. Pittsburgh scored on a touchdown run with 10 seconds left in the fourth quarter to cut the score to 24-23. The Steelers failed on a potential game-winning two-point conversion, and Indianapolis recovered the ensuing onside kick to give them their second win of the preseason. Indianapolis was the first to score as quarterback Peyton Manning threw a two-yard touchdown pass in the first quarter. The Falcons connected on two field goals before the Colts returned a fumble for a touchdown. Atlanta scored two touchdowns in the final three minutes of the first half to take a 20-14 lead at halftime. The two teams traded touchdowns in the second half as Atlanta clinched the 27-21 victory. The Colts and Bills combined to score 45 points in the first half. Running back Joseph Addai scored Indianapolis’ first points of the game on a 17-yard run in the first quarter. Quarterbacks Peyton Manning and Curtis Painter each threw touchdown passes in the first half but the Bills led 24-21 at halftime. Buffalo held the Colts scoreless in the second half and added a field goal and touchdown in the fourth quarter to seal the 34-21 win over Indianapolis. The NFL also announced two other games and a new stadium as part of the 2016 International Series. The St. Louis Rams will host the NFC East team that finishes in the same spot in the standings as the Rams do in the NFC West based on the NFL’s scheduling formula. The Week 7 matchup will be the first-ever NFL game to take place at Twickenham Stadium in London. Additionally, the Cincinnati Bengals will play host to the Washington Redskins in Week 8 at Wembley Stadium. At the conclusion of the 2016 season, either 23 or 24 teams will have played in London since the inception of the International Series in 2007. Since that time, the NFL has achieved accelerated growth in the UK. Sunday viewership of NFL games has more than doubled and the Super Bowl audience has increased more than 75 percent. The league also has developed new and stronger business partnerships and, according to internal research, has a UK fan base of more than 13 million. Participation in amateur football in the UK has risen by approximately 15 percent per year since 2007, with the latest figures showing that 40,000 people age 16 or older play regularly. ATLANTA – Back from a bye week, the 2015 Colts kept the drama high in a comeback victory over the Atlanta Falcons. With the 24-21 win, the Colts kept their lead in the AFC South thanks to a head-to-head tiebreaker over the Houston Texans. The Colts (5-5) will conclude the month of November next with a Week 12 contest against the Tampa Bay Buccaneers (5-5). CARDIAC COLTS – Down two touchdowns late in the third quarter, things didn’t look too good for the Colts. Yet, behind key plays from all three units, the Colts orchestrated a comeback victory in their first game back from the bye week. The road victory was the third of the season for the Colts—something that will be needed if this team is going to make a run in January. D’QWELL’S GAME-CHANGING PLAY– Set up by a punt downed at the Falcons one-yard line, the Colts defense came up with the play of the day. Falcons quarterback Matt Ryan never saw Colts inside linebacker D’Qwell Jackson over the middle of the field and the six-yard interception return by No. 52 tied the score at 21. 40-YEAR OLD QB CAN STILL PLAY – Just three quarterbacks in NFL history have won three straight starts (Warren Moon, Brett Favre and now Hasselbeck). Outside of a couple of clear, miscommunication interceptions, Hasselbeck keyed a two long Colts touchdown drives at the end of the second and third quarters along with the plays leading into Vinatieri’s game-winner. CROWDED AFC SOUTH – With Sunday’s win, the Colts evened their record at 5-5. That ties them with Houston, who beat the Jets on Sunday to stay at 5-5 on the season. With Jacksonville at 4-6, the Colts win on Sunday carried some hefty AFC South implications with six games remaining.